I wanted to create this thread to make this information easier for newcomers to find. Making it more blatantly titled. Also to add some resources and invite further discussion. Please do post links or references! I'll try and get some more informative facty facts and quotes posted here soon. Interesting stuff! Thank you for posting that. Good articles! Very useful info. Thanks, that PDF is a great addition as well! 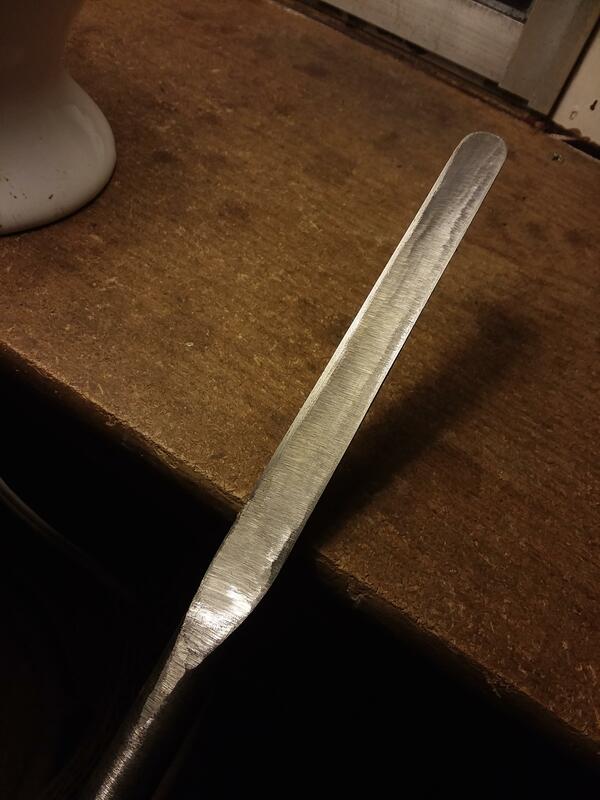 So I think I'm going to go forward with a rough plan for making my own D bit tapered reamer. The drills, bores, and the processes of flutemaking and tool making that I'm working with are seemingly less precise compared to the standards of many of the professional flute makers on this forum, so I hope you'll bear with me in understanding the degree of precision I'm going for at this point in my process. Always improvements to be made! Note, I'm making solid wood, keyless flutes in a variety of sizes and tunings, but especially a low D.
I've been using a 3/4" ship auger to bore my flutes on a lathe (with a hollow tail stock as described in The Amateur Wind Instrument Maker). Before, the ship auger bit originally had a lead screw and it's diameter at the head of the bit was a full 3/4", and the length of the bit below the head was slightly less, about 17.3mm. 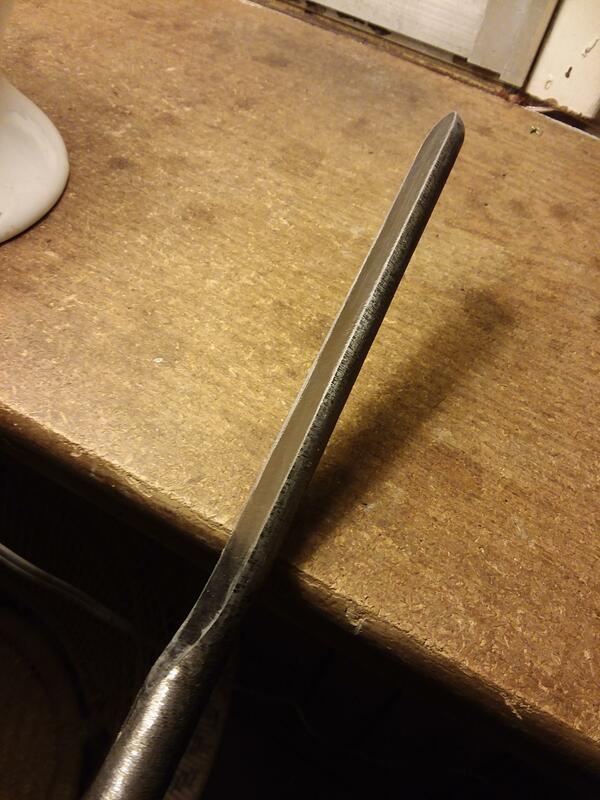 I have retooled the bit numerous times to give it a nice self-centering head without a lead screw. This has completely removed the original head of the bit. So now the bit bores at that 17.3mm. 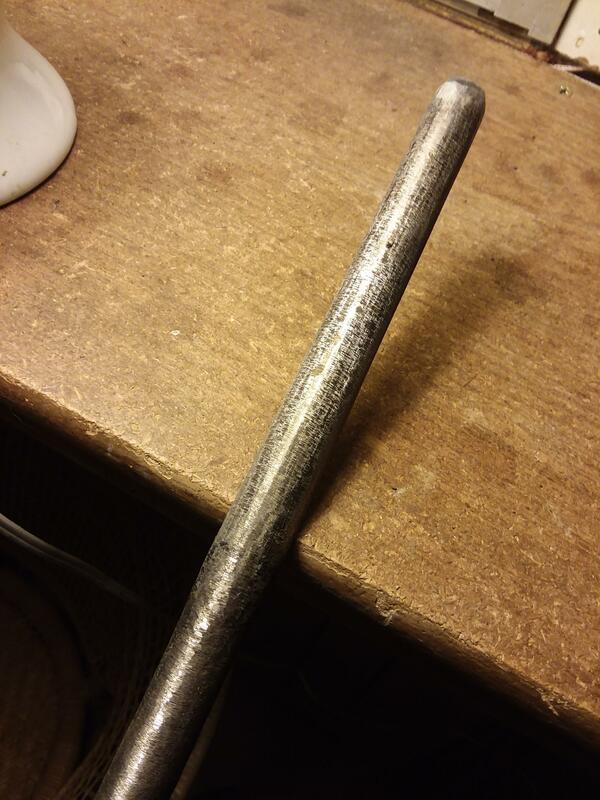 I have made several of my own reamers: moreorless a slotted wooden dowel (sort of like a clothespin) on the end of a 1/4" steel rod, that I fit with sandpaper. Unintentionally, this has led me to create slightly tapered bores, simply by sanding less in the upstream head of the flute more in the downstream body of the flute. This is a somewhat imprecise but practical method for reaming tapered bores, for someone with the time to do all that sanding! It also is a practical way to adjust bore diameter in irregular ways within the flute, for tuning. Get a 5/8" ship auger bit. Retool the end to remove the lead screw and retool down far enough to bring the diameter of the head down to the diameter of the rest of the length of the bit (so it will be consistent given future retoolings). I'm not sure what this size will be, but im hoping it's around or over 15mm. Get some 3/4" steel rod. 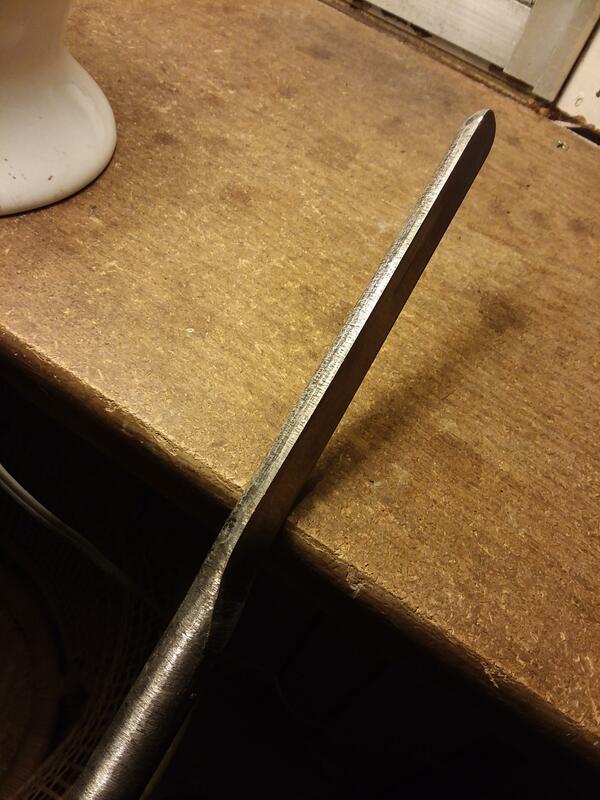 Place this on the lathe and use a sharpening stone to taper a portion of it, so that it tapers from a hair under the diameter of the retooled 5/8" bit to a hair under the diameter of the retooled 3/4" bit. I'm not positive of the length of taper, but I think about 5". Also, reduce the remaining length of the rod a little bit, since it would otherwise still be at 3/4". Take the tapered rod over to the grinding wheel and remove under half of its profile. Then finish with a sharpening stone by hand. Then I'll retemper it to something appropriate. So this is what I'm working with, with the simple tools that I have.. I know my bore size is a bit small, but I've had great low end with maple, oak, alaskan yellow cedar, thus far. Perhaps because of the obscene wall thickness of my embouchure? I'm not sure..
My plan is to then do a new run of low D flutes, and adapt my tonehole placement, undercutting, and everything else later, as accordingly with however the bore will be for those flutes then. Perhaps I should mention, I would bore the whole lenth with the 5/8" drill, then bore the downstream portion of the flute with the 3/4" drill, then ream the head end of the flute with the tapered D bit. Any kind of taper in the headjoint area will help. In the Carnatic flute tradition in India, they select bamboo that has a natural taper near what I assume to be the root of the bamboo (but I've not seen "root end" bansuri, so I won't take my oath on this). Selecting such bamboo cannot be an exact science because each piece is a unique, organic thing. I'm sure the makers get good at sorting through piles of the stuff to find the pieces with just the right amount of taper, but I'm guessing that these natural tapers don't follow anything close to the classic Boehm parabolic taper. Nonetheless, the effect is impressive. Even a little bit of gentle tapering on the approach to the embouchure hole has a dramatic effect on the intonation of the flute. Your method might yield surprisingly good results. I was interested to read Bill's advice to drill large to small, because a large bit in a smaller hole tended to follow one side wall of the smaller hole, rather than concentric. While that may have been a property of the bits he was boring with, such as D bits, it suggests you might want to drill 3/4" first, then 5/8" for the remaining length. I'd second this. I do step boring at times before I use reamers (to save wear and tear on the reamers). You want to drill the largest diameter first and go down from there. Even gun drills, which are excellent at self-centering, will wander when you are following a smaller pilot hole. 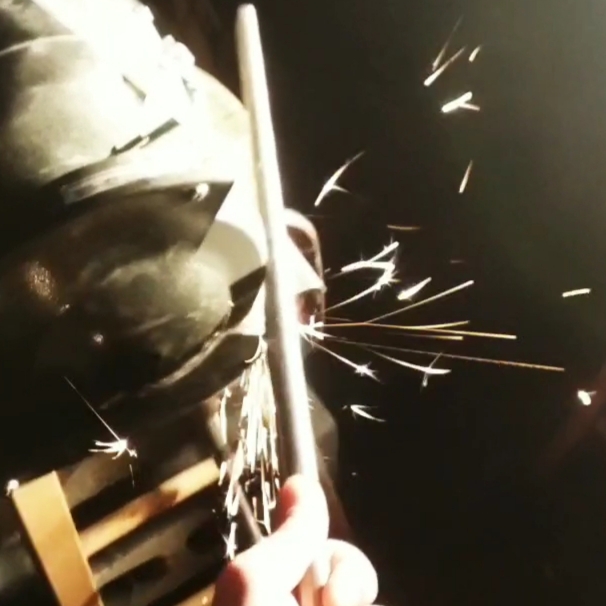 Well I dont recommend trying to turn down 4 ft of steel rod on a wood lathe with an angle grinder. Nor with your friends grandpas angle grinder that is missing its safety guard and likes to learingly eye your hopefully gloved hands. Bad vibes in the wooden wood lathe warp your boring style, it gets all unharmonically uncentered, and molten chunks of fiberglass reinforced grinding wheel are hitting your eyeballs, bad idea. Just as well, carved the (near) half away of the D-bit-- spoon bit?-- with only the stone wheel. Diameter tapers from under 16mm to 18mm over about 5inches, then it rapidly tapers back down to 16~17mm for the remainder of the shank down to the handle area. It is slightly large/unfinished in many of the dimensions, so that i can continue to subtract from it as I finish it with steel brush, fine stones, finish sharpening.. fine finish sharpening stones..
Let's hope it works well! Comments and critiques very very welcome, hopefully I havent majorly screwed up yet. I have some drill bits to retool, before I can test this and report back on the process. Two things: One, the reamer works excellently! Powder-fine saw dust as if I was sanding, and it didnt take too much pressure nor lock up my old lathe. 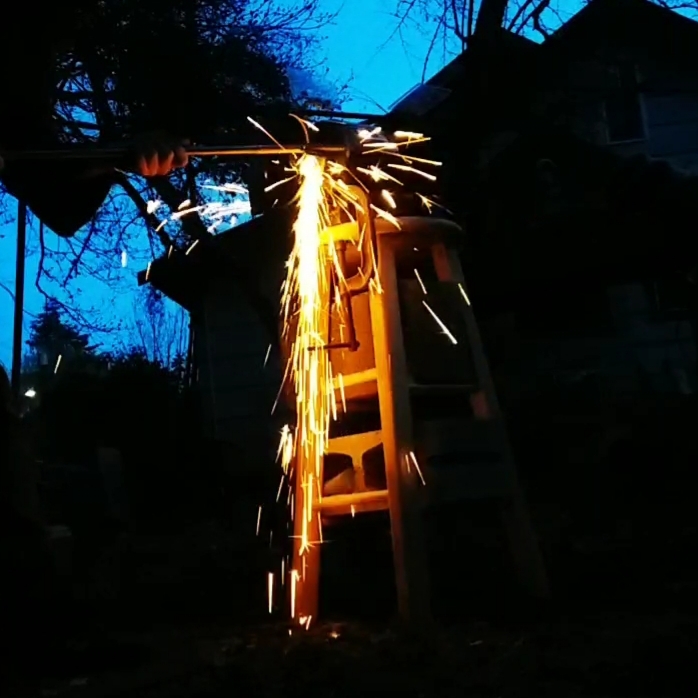 I did this method (large bit first) with my retooled ship auger bits, and it worked great! I did not yet try the opposite (small bit first), so I dont know if, like you said, it "may have been a property of the bits [Bill] was boring with", or not. Again I'm using ship auger bits which I retooled to remove the lead screw and give them a nice sharp edge leading up to the center. I do the drilling on a lathe through a loose fitting tail stock, by holding the bit (well holding the extension of the bit) by hand. I think that doing it by hand allows me to feel the rotation of the wood and subtly adjust my pressure to assist the bit in following the axis of rotation, etc.